The purpose of this League Competition is to provide an enjoyable experience for children between the ages of 6 and 18 years through playing the game of football in a competitive but sporting and fair manner, in accordance with the Competition Rules as set out by the Football Association Standard Code of Rules. The general ethos of the League being that everyone be it players, spectators or officials shall enjoy the experience of participating, that everyone is aware that unsporting behaviour and inappropriate conduct is not tolerated and that child welfare is of the utmost importance. Any registration form which is sent by either of the means set out at Rules 18(A) (i)(a) or (b) above that is not fully and correctly completed will be returned to the Club unprocessed. If a Club attempts to register a player via WGS but does not fully and correctly complete the necessary information via WGS, the registration will not be processed. For Clubs registering Players under Rules 18 (A) (i) (a) or (b) registration forms will be provided in a format to be determined by the Competition. The registration document must incorporate a current passport-size photograph of the Player seeking registration together with confirmation that the Player’s proof of date of birth has been checked by the Club and is accurate. (ii) (ii) A Player registered with a Premier League or English Football League Academy under the Elite Player Performance Plan contained within Youth Development Rules will not be permitted to play in this Competition. Details of the Youth Development Rules are published on The FA website. A Player registered with a FA Girls’ Regional Talent Club may play in this Competition subject to the FA Programme for Excellence (Female) Regulations. (C) A child who has not attained the age of 6 shall not play, and shall not be permitted or encouraged to play, in a match of any kind. (D) A fee as set out in the Fees Tariff shall be paid by each Club/Team for each Player registered, if applicable. (E) The Management Committee shall decide all registration disputes taking into account the following. (i) A Player shall not be permitted to register for more than one Club subject to the exceptions set out in Rule 18 (E) (iii) below. (ii) In the event of a Player signing a registration form or having a registration submitted for more than one Club priority of registration shall decide for which Club the Player shall be registered. The Secretary shall notify the Club last applying to register the Player of the fact of the previous registration subject to the exceptions set out in Rule 18 (E)(iii) below. Except for the purpose of a transfer. And the Player meets the requirements in Rule 18(C). (i) Play for more than one Team in the same age group in the Competition in the same Playing Season without first being transferred. (ii) Having registered for one Club in the Competition, register for another Club in the Competition in that Playing Season, except if the provisions set out in Rule 18 (E)(iii) apply. (G) (i) The Management Committee shall have the power to accept the registration of any Player subject to the provisions of Rule 18(G)(ii) and (iii) below. (ii) The Management Committee shall have power to refuse, cancel or suspend the registration of any Player, the exercise of such power being without prejudice to the Management Committee’s ability to fine a Club at its discretion (in accordance with the Fines Tariff) that has been charged and found guilty of registration irregularities (subject to Rule 7). (iii) The Management Committee shall have the power to refuse or cancel the registration of any Player charged and found guilty of undesirable conduct (subject to Rule 7) subject to the right of appeal to the Sanctioning Authority or The FA. Where the Management Committee does not have enough information to enable it to make a decision pursuant to the above power, it may apply, in its absolute discretion, to the Sanctioning Authority or The FA for further information. (H) Subject to compliance with FA Rule C2(a) when a Club wishes to register a player who is already registered with another club it shall submit a transfer form (in a format as determined by the Competition) to the Competition accompanied by a fee as set out in the Fees Tariff. Such transfer shall be referred by the Competition to the club for which the player is registered. Should this club object to the transfer it should state its objections in writing to the Competition and to the player concerned within 3 days of receipt of the notification. Upon receipt of the Club’s consent, or upon its failure to give written objection within 3 days, the Secretary may, on behalf of the Management Committee, transfer the player who shall be deemed eligible to play for the new Club from such date or 7 days after receipt of such transfer. (I) A Player may not be registered for a Club nor transferred to another Club in the Competition after 1st March except by special permission of the Management Committee. In the event a Club has more than one Team in an age group, each Team must be clearly identifiable but not designated ‘A’ or ‘B’ or 1st or 2nd. In such cases, Players will be registered for one Team only. A Player so registered will be allowed to play for his Club in a younger or older age group within the provisions of Rule 18(C). (K) A register containing the names of all Players registered for each Club, with the date of registration, shall be kept by the (Registrations) Secretary and shall be open to the inspection of an Officer of the Club at all Management Committee meetings or at other times mutually arranged. Registrations are valid for one Playing Season only. In the event of a Non Contract Player changing his status to that of a Contract Player with the same Club, another Club in the Competition or with a club in another competition his registration as a Non Contract Player will automatically be cancelled and declared void unless the Club conforms to the exception detailed in Rule 18(B)(i). (L) A Player shall not be eligible to play for a Team in any special championship, promotion or relegation deciding Competition Match (as specified in Rule 22(A)) unless the Player has played 5 Competition Matches for that Team in the current Playing Season. (M) (i) Subject to Rule 18(N)(ii), any Club found to have played an ineligible Player in a Competition Match or Matches where points are awarded shall have the points gained from that Competition Match deducted from its record, up to a maximum of 12 points, and have levied upon it a fine in accordance with the Fines Tariff. (N) (i) Priority must be given at all times to school and school organisations activities. Failure to comply with this Rule will result in a fine in accordance with the Fines Tariff. (ii) The availability of children must be cleared with their head teacher (except for Sunday league competitions). (iii) A child under the age of 15 as at midnight on 31 August in the relevant Playing Season, shall not be permitted to play in a Competition Match during that Playing Season where any other Player is older or younger than that child by two years or more. (O) Immediately prior to the commencement of a match the appointed Club Representative of each team shall present themselves to the opposition Club Representative to exchange and check the validity of the Surrey Primary League Player Registration Cards (paper or electronic). Any team that fails to correctly check the eligibility of players through this process shall be liable to a fine as follows: First Offence £10.00, Second Offence £20, 3rd Offence £30 and subsequent Offences an increase of £10.00 per Offence. (P) In the event that a player’s Surrey Primary League Player Registration Card is not available for production the matter shall be brought to the immediate attention of the opposition Club Representative and reported to the match Referee (whether qualified or not). Both Clubs shall submit a report to the League Secretary and Age Group Secretary no later than three days following the playing of the match, providing the name and date of birth of the player and reasons for the non-production details of the Surrey Primary League Player Registration Card. The Referee shall include details in his match report to the League. A Club that fails to produce a Surrey Primary League Player Registration Card for a player or substitute playing in a match shall be liable to a fine not exceeding £100. (Q) All Player eligibility issues shall be brought to the immediate attention of the opposition Club Representative and reported to the match Referee (whether qualified or not). The complaining Club shall submit a report to the League Secretary no later than three (3) days following the playing of the match, giving full details of the discrepancy as per Rule 7(A)(i). The Referee shall include details of the complaint in his match report to the League. (R) (i) A Club that has more than one team in a specific Age Group may Transfer players between their teams. The team the player wishes to transfer to shall submit a transfer form to the Registrations Secretary accompanied by a fee of £5. A player may not be transferred to another team within the same Club and Age Group after 31st January except by special permission of the League Management Committee. (S) For all teams competing in the competitive Under 12 up to and including the Under 18 age groups, the number of players registered must not be greater than double the size of its Team in an age group. Every Club must register the colour of its shirts and shorts with the Secretary by [date] who shall decide as to their suitability. Any Team not being able to play in its normal colours as registered with the Competition shall notify its opponents the colours in which they will play (including the colours of the goalkeeper jersey) at least 5 days before the Competition Match. If, in the opinion of the referee, two Teams have the same or similar colours, the HOME Team shall make the change. Should a Team delay the scheduled time of kick-off for a Competition Match by not having a change of colours they will be fined in accordance with the Fines Tariff. Shirts must be uniquely numbered, failing which a fine will be levied in accordance with the Fines Tariff. Clubs must take all reasonable precautions to keep their Grounds in a playable condition. All Competition Matches shall be played on pitches deemed suitable by the Management Committee. If through any fault of the home Team a Competition Match has to be replayed, the Management Committee shall have power to order the venue to be changed. All Competition Matches shall have a duration as set out below unless a shorter time is mutually arranged by the two Clubs in consultation with the referee prior to the commencement of the Competition Match, and in any event shall be of equal halves. Competition Matches should be played in accordance with the Laws appropriate to the relevant age group, as laid down by The FA, as detailed below. The times of kick-off shall be no earlier than 10am and no later than 2pm and can only be altered by the mutual consent of the two competing Clubs prior to the scheduled date of the match with written notification given to the Secretary at least 5 days prior. Referees must order Competition Matches to commence at the appointed time and must report all late starts to the Competition. (B) Except by permission of the Management Committee all Competition Matches must be played on the dates originally fixed but priority shall be given to The FA and parent County Association Cup Competitions. All other matches must be considered secondary. Clubs may mutually agree to bring forward a Competition Match with the consent of the Secretary. Failure to comply with this Rule will result in a fine in accordance with the Fines Tariff. In the case of a revised fixture date, the Clubs must be given by the Competition 5 clear days’ notice of the Competition Match (unless otherwise mutually agreed). (C) An Officer of the home Club must give notice of full particulars of the location of, and access to, the Ground and time of kick-off to the Match Officials and an Officer of the opposing Club at least 5 clear days prior to the playing of the Competition Match. If not so provided, the away Club shall seek such details and report the circumstances to the Competition. Failure to comply with this Rule will result in a fine in accordance with the Fines Tariff. At the under 7, 8, 9, 10 & 11 development age groups teams who have less than the full number of players for their format will notify the League Secretary as soon as possible and the opposition will play with the same number of players i.e. 4v4, 5v5, 6v6. At all other age groups teams will be encouraged to play with the same number of players. The intention of this rule is to allow games to go ahead and will not be allowed as a regular occurrence. Teams deemed to be trying to gain an advantage from this rule will be dealt with by the management committee. The spirit of this rule is to allow for a better experience for players and to facilitate development. (E) (i) In competitions where points are awarded, home and away matches shall be played. In the event of a Club failing to keep its engagement the Management Committee shall have the power to impose a fine (in accordance with the Fines Tariff), deduct points from the defaulting Club, award the points from the Competition Match in question to the opponents, order the defaulting Club to pay any reasonable expenses incurred by the opponents or otherwise deal with them except the award of goals. Notwithstanding the foregoing home and away provision, the Management Committee shall have power to order a Competition Match to be played on a neutral ground or on the opponent’s Ground if they are satisfied that such action is warranted by the circumstances. (ii) Any Club unable to fulfil a fixture or where a Competition Match has been postponed for any reason must, without delay, give notice to the Secretary, the Competition Referees Appointments Secretary, the secretary of the opposing Club and the Match Officials. (iii) In the event of a Competition Match not being played or abandoned owing to causes over which neither Club has control, it should be played in its entirety on a date to be mutually agreed by the two Clubs and approved by the Management Committee. Failing such agreement and notification to the Secretary within 2 days the Management Committee shall have the power to order the Competition Match to be played on a named date or on or before a given date. Where it is to the advantage of the Competition and the Clubs involved agree, the Management Committee shall also be empowered to order the score at the time of an abandonment to stand. (iv) The Management Committee shall review all Competition Matches abandoned in cases where it is consequent upon the conduct of either or both Teams. Where it is to the advantage of the Competition and does no injustice to either Club, the Management Committee shall be empowered to order the score at the time of the abandonment to stand. In all cases where the Management Committee are satisfied that a Competition Match was abandoned owing to the conduct of one Team or its Club member(s) they shall be empowered to award the points for the Competition Match to the opponent. In cases where a Competition Match has been abandoned owing to the conduct of both Teams or their Club member(s), the Management Committee shall rule that neither Team will be awarded any points for that Competition Match and it shall not be replayed. No fine(s) can be applied by the Management Committee for an abandoned Competition Match. (v) The Management Committee shall review any Competition Match that has taken place where either or both Teams were under a suspension imposed upon them by The FA or Affiliated Association. In each case the Team that was under suspension would be dealt with in the same manner as if they had participated with ineligible players in accordance with Rule 18(N)(i) above. Where both Teams were under suspension the Competition Match must be declared null and void and shall not be replayed. (vi) A club may apply for a fixture to be postponed NO LESS THAN 14 days from the scheduled fixture date. Any fixture postponement within 3 days of the scheduled fixture date will be automatically awarded to the opposition unless the opposition team agrees the fixture to be rescheduled. Any request from opposition teams must be received by the Secretary within 2 days of the fixture. 2nd or further postponements = Fixture will be awarded to the opposition unless the opposition team requests that the fixture to be rescheduled. Any request from opposition teams must be received by the Secretary within 2 days of the fixture. (vii) A team that has played 30% or LESS of the scheduled Fixtures by 31st December will be referred to the Management Committee and may be removed from any Cup or Trophy events organised by the Competition. (F) A Club may at its discretion and in accordance with the Laws of the Game use substitute Players in any Competition Match. For Under 13s – Under 18s – [up to 7 may be selected from 7 substitute Players]. A Player who has been substituted becomes a substitute and may replace any Player at any time subject to the substitution being carried out in accordance with Law 3 of the Laws of Association Football. For Under 11s – Under 12s – [up to 5 may be selected from 5 substitute Players]. A Player who has been substituted becomes a substitute and may replace any Player at any time subject to the substitution being carried out in accordance with Law 3 of the Laws of Association Football. In Youth Football only, the referee shall be informed of the names of the substitutes not later than 5 minutes before the start of the match and a Player not so named may not take part in the match. A Player who has been selected, appointed or named as a substitute before the start of the match but does not actually play in the game shall not be considered to have been a Player in that game within the meaning of Rule 18 of this Competition. A player is only permitted to participate in one (1) fixture in this Competition in a single day irrespective of the amount of playing time. (G) The half time interval shall be of 5 minutes’ duration, but it shall not exceed 15 minutes. The half time interval may only be altered with the consent of the Match Officials. (H) The Teams taking part in Under 7s to Under 11 or Youth Football shall identify a Team captain who may/shall wear an armband and shall have a responsibility to offer support in the management of the on-field discipline of his/her teammates. Failure to comply with this Rule will result in a fine in accordance with the Fines Tariff. (I) The home team must provide at least two footballs of match quality fit for play and the referee shall make a report to the Competition if the footballs are unsuitable. A size 3 ball will be used for age groups U7 to U9. A size 4 ball will be used for age groups U10 to U14. A size 5 ball will be used for all other age groups. For the purpose of this Competition only Nike Strike, Premier, Magia or Ordem Match footballs can be used. In the event that a permitted ball is not used it must be reported on the match card and may result in a fine of £10.00 to the Home team only. This rule is intended to standardise and improve the quality of match footballs used within the Competition and thereby enhance the football experience for all participants. Goal nets must be used. (J) In the event that a double header is sanctioned to be played in this competition then the timings in the table below will apply. (K) Each home club shall make arrangements for the provision of designated areas for spectators. This area can be marked by an additional painted line, the use of cones, a roped off area or use of a temporary spectator barrier. The area for spectators should start two metres from the touchline on one side of the pitch and team officials/coaches should be positioned on the opposite side. The area should run the full length of the pitch. It is recognised, however, that the alignment of some public pitches does not allow for this arrangement in which case other appropriate arrangements should be made. 4th Instance – Club Senior Management meeting with representatives of the Competition. 6th & subsequent Instances – 1 game suspension. Any breaches of Competition Rules will be determined by the Management Committee and misconduct by individuals or Clubs will be referred to the County FA to which the Club is affiliated. (A) The Secretary must receive within 5 days of the date played, the result of each Competition Match in the prescribed manner. This must include the forename(s) and surname of the Team Players (in block letters) and also the referee markings required by Rule 23, or any other information required by the Competition. Failure to do so will incur a fine (in accordance with the Fines Tariff). (B) Both Clubs shall SMS the result of each match to the fixtures secretary by 7pm. Clubs in default shall be fined (in accordance with the Fines Tariff). (C) The match result notification, correctly completed, shall be signed by an Officer of the Club, or as prescribed by the Competition. Failure to do so will result in a fine (in accordance with the Fines Tariff). (D) The Competition and Clubs are permitted to collect but NOT publish results or any grading tables for fixtures involving Under 7s, Under 8s, Under 9s, Under 10s, and Under 11s. Any Competition failing to abide by this Rule will be dealt with by the Sanctioning Authority, and any Club failing to abide by this Rule will be fined (in accordance with the Fines Tariff). The Competition and Clubs are permitted to collect and publish results for trophy events. (E) The Competition requires teams which record a Players Fair Play, Manager & Coaches or Supporters mark of two (2) or less to provide the Secretary must receive a report within 5 days of the date played. A fine (in accordance with the Fines Tariff) may be imposed for a breach of this Rule. (F) The Competition requires teams which record a Match Official mark of sixty (60) or less to provide the Secretary must receive a report within 5 days of the date played. A fine (in accordance with the Fines Tariff) may be imposed for a breach of this Rule. (A) In Competitions where points are awarded, Team rankings within the Competition will be decided by points with three points to be awarded for a win and one point for a drawn Competition Match. The Teams gaining the highest number of points in their respective divisions at the end of the Playing Season shall be adjudged the winners. Competition Matches must not be played for double points. In the event of two or more Teams being equal on points at the end of the Playing Season, rankings may be determined by a deciding match or matches played under conditions determined by the Management Committee, or the position shared. (B) Automatic promotion shall be applied for the first 2 Teams and automatic relegation shall be applied for the last 2 Teams in each division except as provided for hereunder, subject to the provisions of Rule 2(B). (D) In the event of a Team withdrawing from the Competition before completing 75% of its fixtures for the Playing Season all points obtained by or recorded against such defaulting Team shall be expunged from the Competition table. For the purposes of this Rule 22 (D) a completed fixture shall include any Competition Match(es) which has been awarded by the Management Committee. (A) Registered referees (and assistant referees where approved by The FA or County FA) for all Competition Matches shall be appointed in a manner approved by the Management Committee and by the Sanctioning Authority. (B) In cases where there are no officially appointed Match Officials in attendance, the Clubs shall agree upon a referee. An individual thus agreed upon shall, for that Competition Match, have the full powers, status and authority of a registered referee. Individuals under the age of 16 must not participate either as a referee or assistant referee in any open age competition and individuals under the age of 14 must not participate either as a referee or assistant referee in any Competition Match. Referees between the ages of 14 and 16 are only eligible to officiate in competitions where the Players’ age band is at least one year younger than the age of the referee, for example a 15 year old referee may only officiate in competitions where the age banding is 14 or younger. (C) Where assistant referees are not appointed each Team shall provide a Club assistant referee. Failure to comply with this Rule will result in a fine (in accordance with the Fines Tariff) being imposed on the defaulting Club. (E) Subject to any limits/provisions laid down by the Sanctioning Authority, Match Officials appointed under this Rule shall be paid a match fee in accordance with the Fees Tariff and travel expenses of £0.50 per mile / or inclusive of travel expenses. Assistant Referees £15.00, and any other permitted expenses actually incurred, subject to any limits laid down by the sanctioning Association(s). (F) In the event of a Competition Match not being played because of circumstances over which the Clubs have no control, the Match Officials, if present, shall be entitled to half fee plus expenses. Where a Competition Match is not played owing to one Club being in default, that Club shall be ordered to pay the Match Officials, if they attend the Ground, their full fee and expenses. Failure to comply with this Rule will result in a fine in accordance with the Fines Tariff. (M) Where an official has been appointed by the Competition he/she will only be used for that fixture and not transferred to a different fixture. If the club have additional fixtures requiring an official, they should contact the Referees Secretary in the first instance and not make a direct approach to the official. (N) All officials, whether qualified or not, who intend to regularly officiated in the Competition must register with the League prior to officiating any fixture. (O) Any Referee, whether qualified or not, scoring less than 50 marks on three or more match card entries, from different teams, will be reviewed by the Management Committee and may be asked not to officiate at further League fixtures. In this case the Referees Secretary shall inform the County Football Association with which the Referee is affiliated with a view to providing suitable training to bring the referee to an acceptable standard. The Competition shall be called the Surrey Primary League Cup and Trophy Competition and shall be open to Clubs competing in the League. The Rules of the Surrey Primary League Competition shall apply when not covered by these Rules. The Cups shall be competed for annually and shall not become the property of any one Club. Medals or trophies may, at the discretion of the Management Committee, be awarded each season. The Entrance Fee shall be covered within the League Competition’s Annual Subscription. The settlement of all financial matters, including the payment of fines imposed, must in all cases, unless otherwise ordered, be made within 14 days. In the event of a fine being then unpaid it shall be doubled. The Officers of this Competition shall be as appointed to the Surrey Primary League. The management and business of this Competition shall be transacted by the Management Committee. A sub-committee may be appointed with full powers as those of the Management Committee. The decisions of the Committee or the sub-committee shall be final and binding, subject to appeal in accordance with League Competition Rules 7. All Teams, in an Age Group, will automatically be entered into the Cup Competition as may be organised from time to time for the Age Group and matches shall be played on the dates notified by the Secretary. The League Competition Rules and those set out herein shall apply in full as applicable to each Age Group for which a Cup and Trophy Competition is organised. No player shall be allowed to play for more than one competing team in the Cup/Trophy Competitions of the age group the player is registered. Newly registered players, not subject of a transfer from another team in the League, must be registered with the Competition before the 31st January of the current season. In the case of postponed or replayed matches, only those players, who were eligible on the date on which the match was originally due to be played, shall be allowed to play. Any Club playing an ineligible player shall be ruled out of the Competition and shall be fined fifty pounds (£50) for each ineligible player, or otherwise dealt with as the Management Committee may determine. (A) With exception of the Cup Final, all ties shall be played on the ground of the first- named Club. 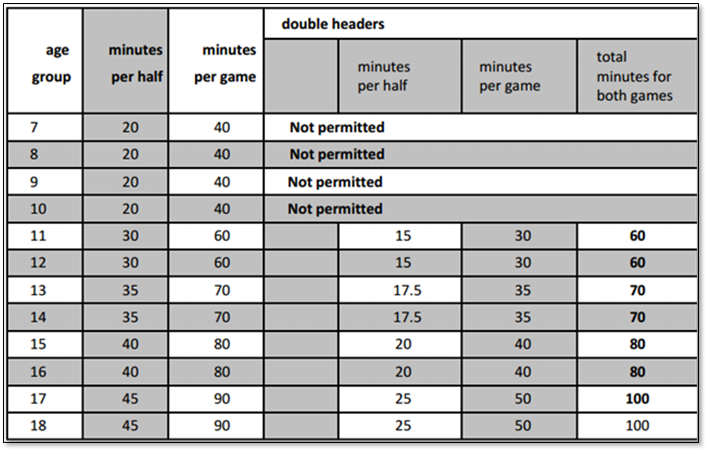 Play should be of such duration as determined in League Competition Rule 20. (B) If the scores are equal at full-time penalty kicks in accordance with the Laws of the Game’ shall determine the result. There will be no additional /extra time prior to the penalty kicks. (C) Matches abandoned through circumstances over which neither side has control, shall be replayed in their entirety. In any tie ordered to be replayed in consequence of a breach of Rules, the Management Committee may order the defaulting Club to pay the costs of the replay. In the event of two Clubs taking part in the same match having similar colours, the home team shall change. (D) The reporting of the results of all Cup Competition matches shall be in accordance with League Competition Rules. (E) In the event of a Club failing to keep an arranged fixture, the Management Committee shall have the power to impose a fine not exceeding seventy five pounds (£75), order the defaulting Club to pay any expenses incurred by the opponents, disqualify them from the Competition or otherwise deal with them at their discretion. (A) The Management Committee shall make the draw or appoint an appropriate person to make the draw for all rounds of the Cup or Plate Competitions. (B) Teams eliminated from the first two rounds (First Round and Second Round), of the Cup Competition shall be entered into the Trophy Competition (if any) which shall otherwise have the same Rules as the Cup Competition. (A) Whenever possible, Referees shall appointed for all cup ties and officially appointed registered Assistant Referees shall be appointed for the semi-finals and finals. The failure of the home Club to notify the Referee, as required in accordance with League Competition Rules, shall result in a fine of ten pounds (£10). (B) In all rounds of the Cup Competitions up to and including the semi-finals the match official’s fee is to be borne by the home team. (C) Where Assistant Referees have not been appointed, each Club shall provide a competent Assistant Referee for the match. Any Club failing to do so shall be fined ten pounds (£10) for each offence. The Entrance Fee shall be payable if a team fails to attend or withdraws within 14 days of the Festival. All entrance fees will be donated to the SPL nominated Charity. The settlement of all financial matters, including the payment of fines imposed, must in all cases, unless otherwise ordered, be made within 14 days. In the event of a fine being then unpaid it shall be doubled.